Tap this page for Pak Army Remount Depot Mona Jobs 2019 Latest Career Opportunities. Remount Depot Mona invites applications from the local residents Mona Domiciled who are under Matric for the vacant positions given below. 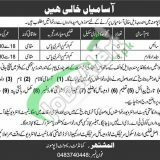 Jobs in Remount Depot Mona are such as (Baildar Farm (BPS-01), Sais (BPS-01)). Candidates who are just Matric or Under Matric but having relevant skills and experience are welcome to apply because it is the finest opportunity for those who are not well educated but wanted to be part of Government Department. So, if you selected against any of the above positions, you'll be able to have all the facilities offered as per the rules and regulations of Pakistan Army. So, all interested candidates who fulfil the criteria for the vacancies should apply as per the following how to apply procedure given below. Applications on plain paper along with attested copies of educational certificates, experience certificates, CNIC, domicile and recent photographs should reach the following address given below. No TA/DA will be paid to candidates appearing for test/interview. Candidates should bring original documents at the time of test/interview. Address: Remount Depot Mona, Punjab.